Book People was founded in 1988 by two book enthusiasts, Ted Smart and Seni Glaister, on the principle of making books available and affordable to everyone. Book People sells a selection of bestselling books at affordable prices. Book People knows how important its customers and offers its Book People Promise, with products you love, service you deserve, prices you won’t believe. Book People has a dedicated team of book experts that use their vast experience to select hand-picked favourites. Book People also has an extensive library where there is something for everyone, from the latest titles to timeless classics. Book People offer history Jan	2017 Apr	2017 Jul	2017 Oct	2017 Jan	2018 Apr	2018 Jul	2018 Oct	2018 Jan	2019 Apr	2019 Discount Code 12% off £30 spend with discount code from Book People! 10% off orders over £25 with discount code from Book People! 12% off Hand-Picked Favourites with coupon code from Book People! 8% off all orders over £30 with discount code from Book People! 10% off orders over £35 with discount code from Book People! 15% off hand-picked favourites with voucher code from Book People! £8 off orders over £40 with discount code from Book People! 10% off orders over £40 with discount code from Book People! Get £6 off orders over £40 with discount code from Book People! 10% off orders with min spend of £35 with discount code from Book People! £8 off orders over £40 with Book People voucher code! 20% off books hand-Picked by Book People with discount code! 15% off Book People hand-picked favourites with discount code! 5% off when you spend of £30 and use this voucher code from Book People! Free delivery and free gift with Book People discount code! Get £5 off orders over £40 with Book People's discount code! £6 off orders over £40 with promo code from Book People! 20% off Book People Hand-Picked Favourites with discount code 5% off orders over £35 with discount code from Book People Save 5% when you spend £35 with discount code from Book People Discount code gives 20% extra off Book People's Hand-Picked Favourites 15% off Book People Hand-Picked Favourites with discount code 12% off when spending £30 or more with discount code from Book People 10% off orders over £30 with discount code from Book People Offer Clearance at Book People - Up to 88% off! Clearance at Book People - Up to 88% off! 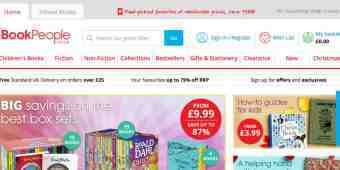 Clearance at Book People - Up to 84% off Delivery Free standard UK delivery on orders over £25 at Book People!